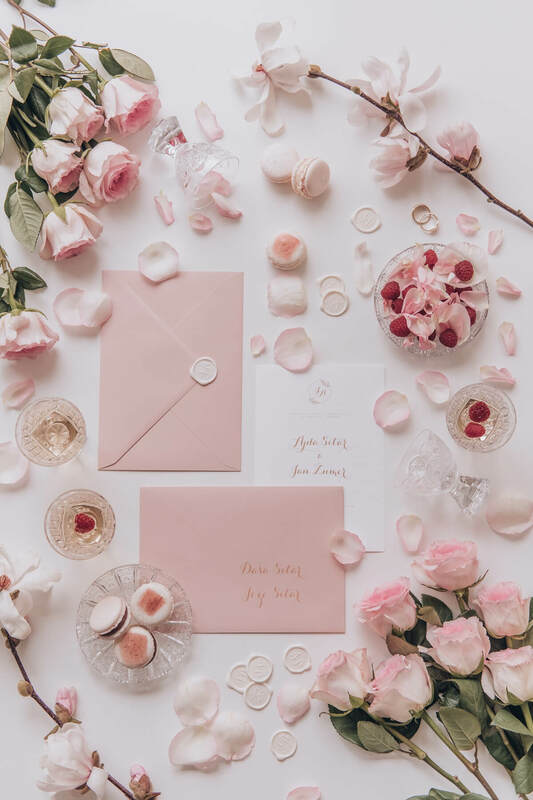 Wedding invitations are (after the announcement of a marriage in one way or another) in fact the first slightly more formal contact with your wedding guests. The first step can be the “save the date” cards. In Slovenia, this is not very common, very often the future groom and bride orally inform the wedding guests about the date of the wedding before they send out the invitations. 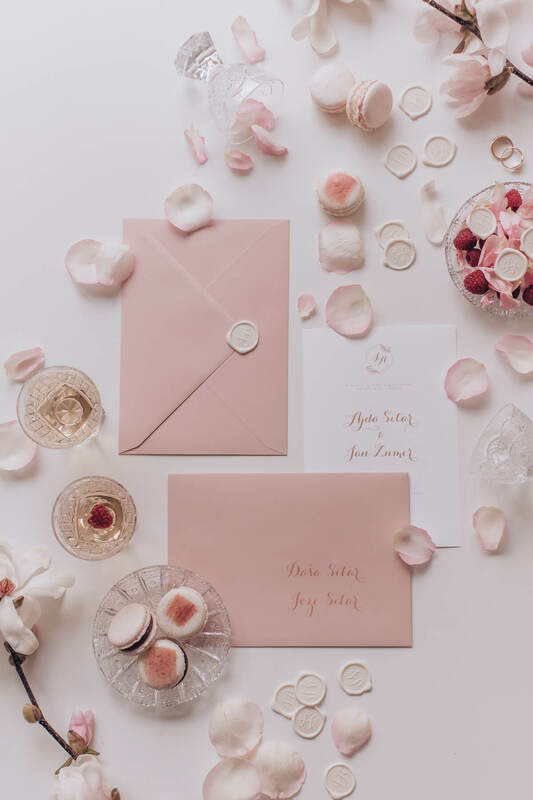 Wedding invitations are an important part of wedding planning, because they can serve as the first hint of the style of your wedding, and at the same time inform your guests of all the most important things related to the wedding. 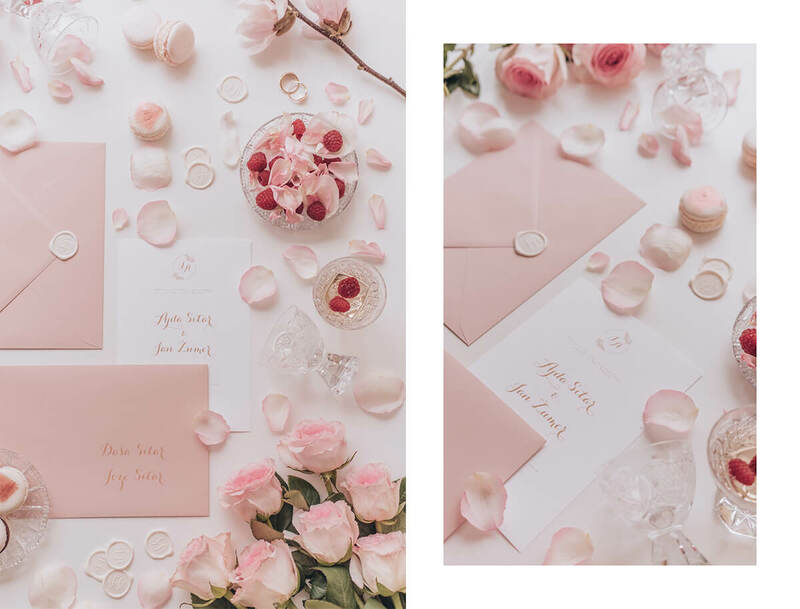 Although I was convinced that the wedding invitations are going to be one of the simplest things of the wedding planning, I was considering of leaving this part to the experts. But in the end, especially with regard to the financial input, I went through the entire process of the visual design, the purchase of materials, etc. – with the help of my wedding organizer Blažka (Infinity events), my friend Žiga Adamčič (who helped me with graphic design) and my dear cousin (who helped me find the an affordable printer). 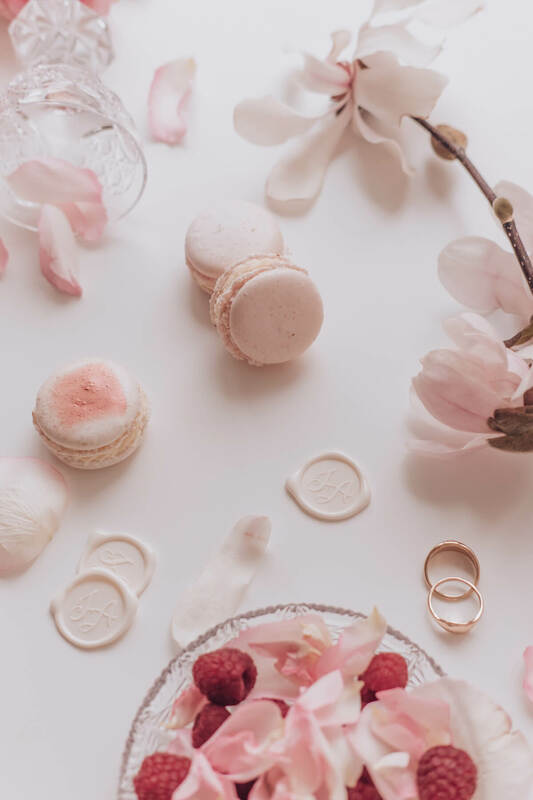 I am aware of the fact that our invitations could have been made in a much simpler way, but I like to create and hand out perfect end-products. It’s just the way I am. 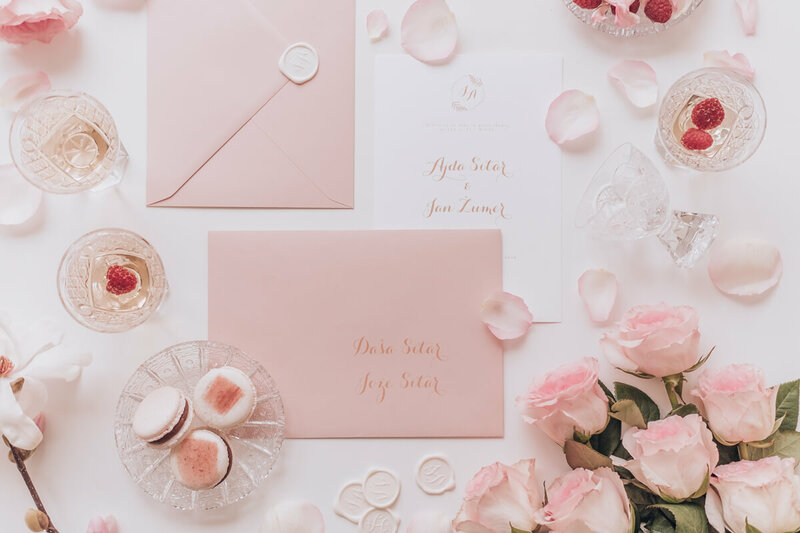 You can read some of the tips that might come in handy when creating your wedding invitations below. Classical, traditional, creative, simple, boho, vintage, chic or elegant wedding invitations – the decision is yours. By choosing a style of your wedding invitation, you will give them a subtle hint of a style of your wedding. Will your wedding be formal, classical and elegant or relaxed? Glamorous or modern? Think about the colors that will be present at your wedding and include these colors in your wedding invitations. You can also add some motifs, such as flowers or olive branches. 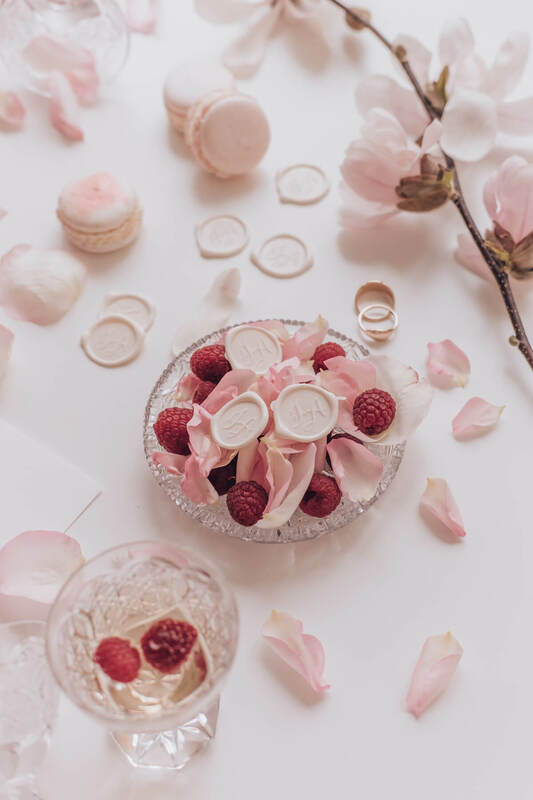 The most beautiful are visually perfected stories, where invitations coincide with the appearance of the entire wedding and all the printed materials that are present on the wedding day – from the greeting, seating charts, to the menu match. The choice is yours. Personally, I find the invitations where one (untangled) sheet is hidden in the envelope (they can also be two) the most appealing. The shape is usually square or rectangular, but you can find all sorts of different shapes. Invitations should not be too small. We decided to go with a slightly bigger size – A5 size of the invitation (the paper) and a C5 envelope size. The price of a single invitation goes from 1 per piece to more than € 100 per invitation. The price depends highly on whether the graphic designer is involved or not. In Slovenia, a graphic designer charges app. 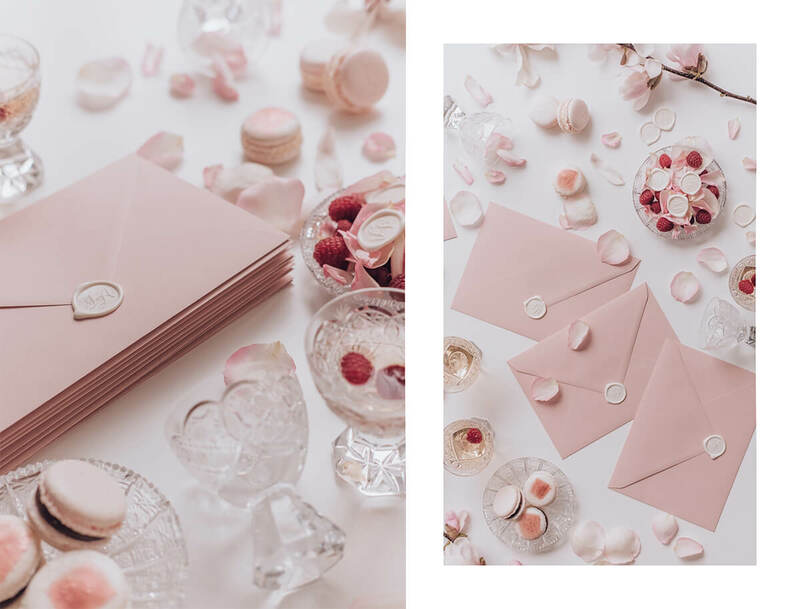 300€ for creating the wedding stationery (usually without print and material included). The price of the printing depends on the printer’s, the color of the printing material, the printing material, the additional price of special printing techniques (such as gold foil, letterpress, etc.). The price of the material can vary greatly – you can get the material yourself or you can ask for help from the printer. The price of invitations can also vary according to additional accessories added – cords, silk accessories, real lace, or seal. Seals have been an extremely popular addition for the past couple of years, for which we have also decided. 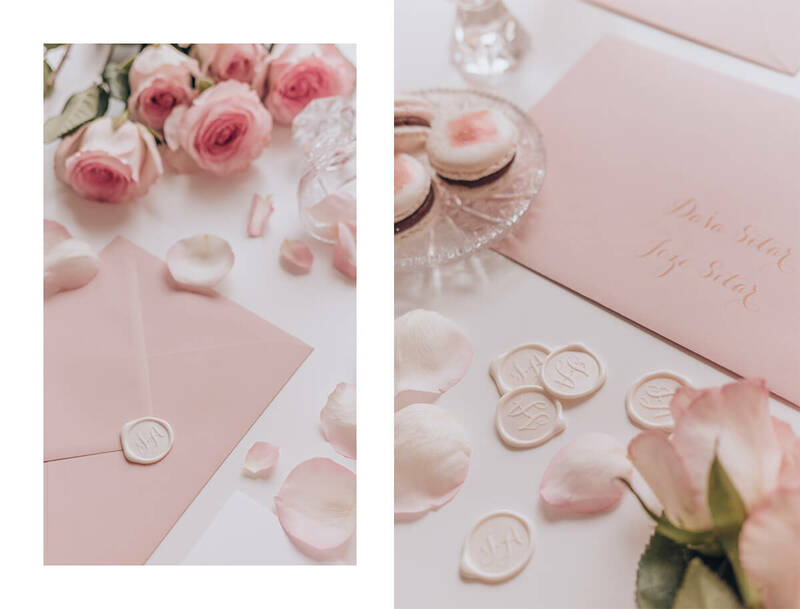 We decided on the Artisaire brand (I found them on Instagram), which does not only produce seal wax stamps and different sealing waxes (for DIY), but also the final wax seals that you simply stick to the envelope. They have a huge variety of colors (our colour is a Soft White), sizes (ours is 25mm), border styles (we have decided on organic style) and the method of fixing (ours is Professional Grade, which can not come off and is therefore suitable for shipping via post too. Most importantly, they’re offering a complete personalization and an excellent quality. You have so much less work, and the final product is much better. Before starting to plan your wedding invitations, count how many invitations you actually need. This number can then be added up by additional 5 invitations, which will serve as your backup invitations. It’s also nice if you save up one invitation until your wedding day. The photographer can create nice memories of this detail on your wedding day too. The last part is the distribution of the invitations – we will send only a few by post, the rest will be distributed personally. Creating invitations at home will surely save you a certain amount of euro, but will take up a bit of your time. If you’re not planning to spend your time on invitations, make sure you carefully select a specialist who’ll help you out. 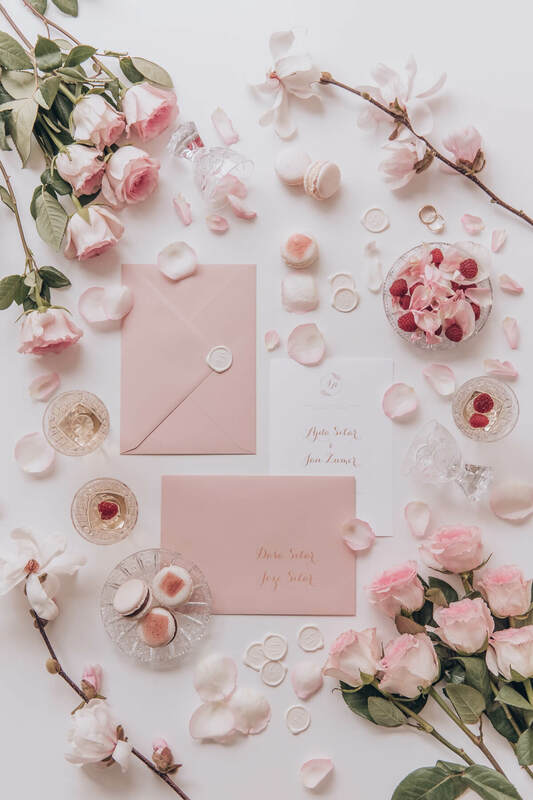 You shouldn’t worry too much about the invitations – it’s just a piece of paper that will sooner or later end up in rubbish (maybe it will be meticulously kept by your grandmother). When to send out or distribute the wedding invitations? Save the date (or an oral announcement of the wedding) can be made from 8 to 10 months before the wedding. Thus, the wedding can already be booked in advance. This is especially important if your wedding is at a time when most people take their annual leaves. 4-6 months before the wedding is the ideal date for a wedding invitation to reach the recipient, but maybe sooner. We’re going to start distributing them half a year before the wedding. If it’s a wedding at a remote destination (where it is necessary to book flights and hotels), then the whole year in advance is enough time. How much time do guests have to confirm their attendance? It depends entirely on your wishes. Often for example it’s necessary to have the number of wedding guests because of other things such as a gifts for guests, making a seat order … It is advisable to put this date at least a month (4 weeks) before the wedding, as usually the wedding venues require the final confirmation of the number of menus before.